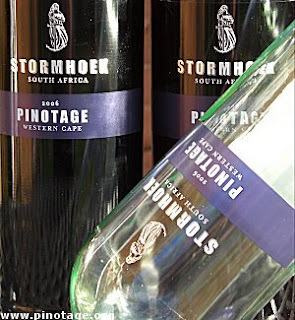 The Pinotage Club: Stormhoek Pinotage -- lets drink it! My thoughts are with everyone connected with Stormhoek -- those poor unfortunates at Orbital who put so much effort into making the brand a success and then who lost their jobs at Christmas, and the people, such as Krisjan van Rooyen and Basjan Manus, farming grapes and making wine in the Cape while worrrying about their future. An announcement is imminent about who has bought the brand in the UK, and we wait to hear whether they intend continuing the 'off the wall' marketing initiatives that has characterised Stormhoek so far. Consumers should currently be on the receiving end of an intense five week marketing campaign for specially labelled pink Valentines Day wines, but this seems to be still-born in the wake of Orbitals crash. So it seems Stormhoek or their new distributers will be left with pallet loads of pink to shift when the dust settles. Trying to do my own little bit to help, I though I should scoop up some Stormhoek Pinotages. It is unusual for a red, but I rather like their clear glass bottle (pictured above). But it is what is inside that counts. I get a very smoky, almost barbecue smoke* nose that follows through on the palate where there are black fruits, cherry and dark plain chocolate flavours, and its a bit meaty and chewy. Good balance, bit short finish. A wine that cries out for a hefty meat dish and thus an ideal braai wine. *"why should the word smoke possess only the name 'smoke', when from minute to minute, second to second, the amalgam of hundreds of odours mixed iridescently into ever new and changing unities as the smoke rose from the fire"